We got to Minute Maid Park several hours early since we got done with the Nolan Ryan Museum early and did not end up in as much traffic as we had expected. This ended up being a great thing because we ended up in the Main Team Shop, which is in the old Union Station. It is really cool how they preserved the Union Station and blended it into being part of the ballpark. In here they have some exhibits of Astros memorabilia related to the recent history of the Astros now celebrating their 10th season at Minute Maid Park. After exploring the old Union Station part of the ballpark we still had an hour before the park opened. We took care of picking up our tickets at will call. We had tickets to the game already for in the 300 section, but we had tickets for the 110 section waiting for us. Marj, who got us into the Diamond Club at Nationals Park, worked at Minute Maid Park before Nationals Park and told her old boss about us, which led to us getting closer seats. We also got a bag of goodies, which included a Pink in the Park Astros t-shirt and wristband, a cool Lone Star Series hat, and a magnet schedule. The really cool thing in the bag was a little baggie of dirt from Minute Maid Park. Yes, dirt is very exciting if it is from a ballpark in my opinion. Also, we got much needed Astro stickers in the bag. None of the souvenir places in the park had stickers, so it was great that we ended up with one to keep the car up-to-date with the ballparks we have been to. Minute Maid Park was an enjoyable place to take in a game. It has a good atmosphere even with it being almost half Cardinals fans for this game. Some people do not like baseball being played indoors, but having gone to so many Diamondback home games it just seems natural to us. Not only does it pretty much guarantee there will not be a rain delay or rain out, but it makes the game much more enjoyable with its air conditioned comfort. Mik loved this park just for being indoors. He does not much care about the air conditioning, but growing up in Arizona has made him a fan of indoor parks. The game was pretty exciting with lots of home runs (6), which included three hit by Astro players, so we got to see the train behind left field go back and forth down the track several times. The first hit of the game was a homer by DeRosa of the Cardinals in the second inning. In the bottom of the inning the Astros' Pence got the Astros first hit of the game in the form of a two-run homer (Blum was on base due to being walked). The Astros them kept the lead the rest of the game adding a run in both the 4th and 5th innings. The bottom of the 7th and top of the 8th were big scoring innings with each team scoring 5 runs. The Astros got 4 of their runs with a Grand Slam by Carlos Lee. Now we have finally seen a Grand Slam on the trip. I have never seen one in person at a Major League game, although I have seen two in one game at a Tucson Sidewinders game. We have been hoping the whole trip to at least see a Grand Slam. Now if we could only witness a no-hitter. At the Braves game we got a sheet of stickers since that was the only option. Dad chose to put the sticker that says Braves, has a tomahawk, and a baseball on the car. 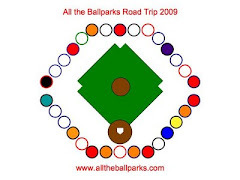 Parking at Turner Field was easy for both games we went to. The parking lot is right across the street from the park and the handicap spots are right in front of the lot. The only issue is that if you get there early like we did you have to walk half a block either way if you want to cross the street at a crosswalk. On the first night that is what we did because there was a lot of traffic. Most people just crossed where they wanted, though, and there is a cut out in the middle of the block, which is most useful after the game when the street is then closed off. When we went to the second game there was very little traffic on that road and we just walked across mid block. Honestly, though, they should have an actual marked crosswalk between the two cutouts, as they just look odd without a crosswalk and people cross there anyways. Getting into the park is not too hard, but it is helpful to know that the gate on the far right next to the brick wall is the wheelchair accessible way past the turnstiles. They do come across as disorganized, though, because on the first night we went the gates opened 20 minutes late. Apparently they had to wait on a cop to be at every gate before they could open the park. The second night they had the cop, but still opened about 5 minutes late. The first thing we did when we got into the park on the first night was go to the Braves Hall of Fame and Museum. This museum is overall accessible, but there is a part that is not accessible. The not accessible part is the train car. There is big steps onto the train car and no lift to go up there. It would be nice if they had something like the Christmas Carol Train Tour used, but then again I think the aisle in the train is also kind of small for a wheelchair to squeeze through. It is at least a minimal part of the museum and most of the info on it is outside the train. On July 16, 2009, our first game of the trip at Turner Field we stuck to our normal getting the cheapest wheelchair seats possible. We sat in section 419. To get to this section we had to find an elevator, which was a little confusing because we kept following the signs that said go forward to an elevator and then suddenly began seeing ones that said go backwards, but if you turned around the one right behind said to keep going the way we were going. It turned out we had gone past one and then got to the midway point were two elevators are the same distance from that point. Anyways we did finally locate the one near one of the ramps with the help of the map they have periodically on the concourse. The seats in 419 were decent seats. They had this cool hallway that led to them that was only supposed to be used by those going to the handicap seats. This help set the section away from the general walking path up and down to the other seats in the section and the only time other fans ended up in our section was in the final inning of the game. However, some of the beer vendors kept being in our section, but by the time the game started they stopped loitering in the handicap section (by the way same thing happened before second game). We had a friendly usher, who took it as her job to move the seats to have a spot for the wheelchair rather an inconvenience like the usher at PNC Park. Note the all the handicap sections can be regular stadium seats, but the seats can be unscrewed and wheeled out of the way when necessary. It is basically the same type of design as at PNC Park, but the friendliness of an usher willing to do their job and make the accommodations be what you paid for makes a big difference. The view from 419 was overall decent. The row was raised above the seats in front, but barely more than normal. Thus they were better than the experience at Orioles Park, but the heads of people in front still sometimes got in the way of seeing from a seated position. It was not too bad, though. At least the view of the field and the scoreboard were otherwise unobstructed. For the second game we saw at Turner Field we asked the best available wheelchair seats. We decided to vary from the norm, since this was a game added in the middle of the trip and it was a special game with Maddux’s number being retired. We ended up with tickets for section 119. When we got there the seats needed to be removed from 119, but it would have removed all three of our seats the way the configuration is, so instead the usher put us one section closer to home plate (117) where seats were already taken out in a few spots. It seems poor planning for them to sell us three seats connected when they knew we needed one wheelchair seat and two companion seats, but at least we again had a helpful usher and it worked out. The view from 117/119 is way better than up at 419 and it is not just because it is closer to the action. It is actually mostly about the seats being raised up above the row in front enough that even when those in front are standing Mik could see the game sitting in his wheelchair. The seats do not have cup holders, but neither did the ones in 419. However, the seats in the rest of the section (i.e. the non-handicap rows) did have cup holders unlike when we sat in the 400s and no one had cup holders. Despite the discrimination in the cup holder situation Mik still thought these seats being raised up enough makes them worth the extra $21 a seat. It is really says something about the seats when he did not want to go early and this one time we had to leave early to get to the next game and did not have to stay because we had already seen a full game at Turner Field the day before. Overall Turner Field is accessible, as one would expect with it being one of the modern ballparks. The cheap seats stand out as the cheap seats in terms of not being raised above the rows in front enough, but they are not too bad. The ones on the lower level, though, turned out to be well worth the extra money, which is not always the case. Plus, the ballpark itself is one of the more enjoyable ones to watch a game at, so it was a good one to end up seeing one and a half games at. At the Braves game I choose a ball with a wood looking background. It says Atlanta Braves on two sides. Another side has the Atlanta Braves A logo. The did have a Turner Field ball, but I did not get it because it did not even say Turner Field on it and the field view look did not look unique. The mini bat Mik choose at the Braves game was one of Turner Field. The bat is natural on the bottom and has a blue background with white tomahawks. On the blue background is an oval image of Turner Field. It also says Turner Field on it.